If you aim to make profit Bow strings is favourable as you get 100-200 for route one per trek (4-12k / hr). 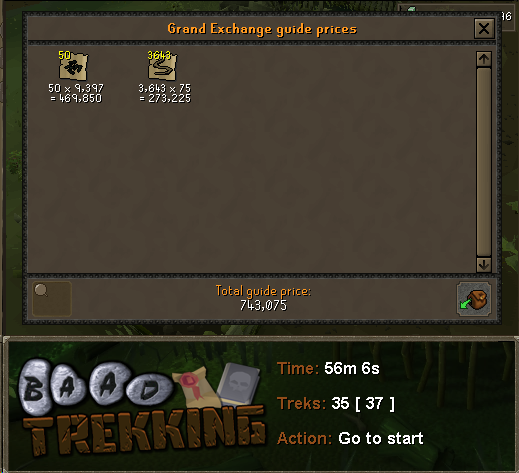 This is a great method for ironman accounts to gain exp and resources. -follower=level : Specify follower difficulty level. Replace "level" with easy, medium or hard. -route=level : Specify route difficulty level. Replace "level" with 1, 2 or 3. -reward=name : Specify reward to select. Replace "name" with one of the following "Pure Essence", "Bowstrings", "Silver bars", "Herbs", "Coal and Iron ore", "Watermelon seeds", "Lobsters", "XP Tome", "Random"
-food=name amount : Specify food and amount to use. Replace "name" with case sensitive name of a food item and "amount" with a number between 5-20 making sure to leave a space in between. -outfit : Include this arg to collect Lumberjack outfit pieces. -nails : Include this arg to collect Nail beast nails. -bankTomes : Include this arg to bank XP tomes instead of reading them. "-nogui -follower=hard -norender -route=2 -food=Salmon 10 -reward=Watermelon seeds -outfit"
"-reward=XP Tome -food=Cake 15 -nogui -follower=east -route=1"
@Pseudo I'd suggest 50-60s as a minimum in melee skills. If you can finish Darkness of Hallowvale which requires 40 strength and the ability to tank a level 169 until he knocks you out then you'll probably have the stats needed to run past level 80 mobs on route one and kill level 40 zombies for the bridge event. As for items I do it in full graceful since you're running a lot but any basic amour is fine and an addy/rune scimitar is more than enough. I plan to add in combat support for routes 2/3 as well as nail beasts for route 1 so the best melee weapon you can use is suggested. @Pseudo It shouldn't be fighting in the combat events but rather evading them unless you mean the Undead lumberjacks for the bridge event then that'll be fixed when the update gets approved. I'll look into the claiming of the xp tome though. This is great! Minor Issue that happens quite infrequently is that it cannot handle rewards screen. After I restart the script it's fine. Any idea on when combat will be supported or when I can purchase premium? @worek This issue with the reward screen has been fixed a long with a lot of other things. Just need to wait for the update to be approved by RSPeer staff. I aim to have support for Nail beasts within the next couple days which will significantly increase profit. It'll probably be a while before support for routes 2 & 3 is added but I think they actually result in less profit/hr. Scripts are required by RSPeer to be free for week prior to being made premium to make sure they high quality. After that you'll be able to purchase. Awesome, I'm personally more interested in the reward tomes, since being able to get level 2/3 reward tome yields so much more xp/hr than anything else. Working flawlessly after last update. Do you have an idea of when you will be able to support route 3 / 2? @worek Atm I've been collecting all the data needed to do efficient runs of routes 2/3 but I'm also working on releasing another script before I go back to uni since I'm currently on break. I'll either get it done in the next week or it could be 2 months from now.